In “netBody: Augmented Body and Virtual Body II”, we link the real world to the online reality of Second Life at the physical level: the bodily movements of a person in the real world control an avatar in Second Life, while an avatar’s movements guide a human being’s. Second Life is a 3D online digital platform created by its residents. Here, each flesh-and-blood human creates a unique identity – an avatar – to inhabit the digital community environment. The contact between these realities is usually realized through a monitor, keyboard and mouse, but in this work, the whole body takes part; we develop technology that makes communication between the two realities two-way and physical. A movement-registering mechanism built into the BodySuit allows a person’s movements to directly control the behavior of an avatar in Second Life. 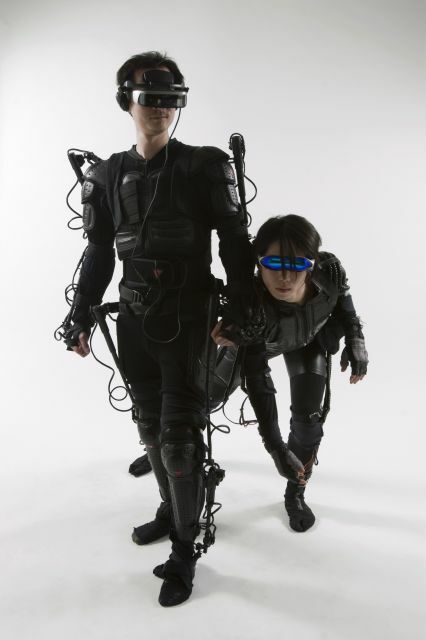 Conversely, the Powered Suit contains motors that control the human body like a marionette. It is a sort of robot you can wear, controlled by an avatar. With this technology, geography, location and space no longer hinder physical interaction between bodies. A Second Life avatar becomes a vehicle for physically connecting the individual to society. This could make it possible for people all over the world with the correct hardware to share each other’s bodies over the Internet. We play with our perception of an individual’s body as his or her identity. Suguru Goto is a composer/performer, inventor and a multimedia artist. He is considered one of the most innovative and the mouthpiece of a new generation of Japanese artists and is highly connected to technical experimentation in the artistic field and to the extension of the existing potentialities in the relation man-machine. In his works, the new technologies mix up in interactive installations and experimental performances; he is the one who invented the so called virtual music instruments, able to create an interface for the communication between human movements and the computer, where sound and video image are controlled by virtual music instruments in real-time through computers. Lately, he has been creating the robots, which perform acoustic instruments, and he is gradually constructing a robot orchestra.